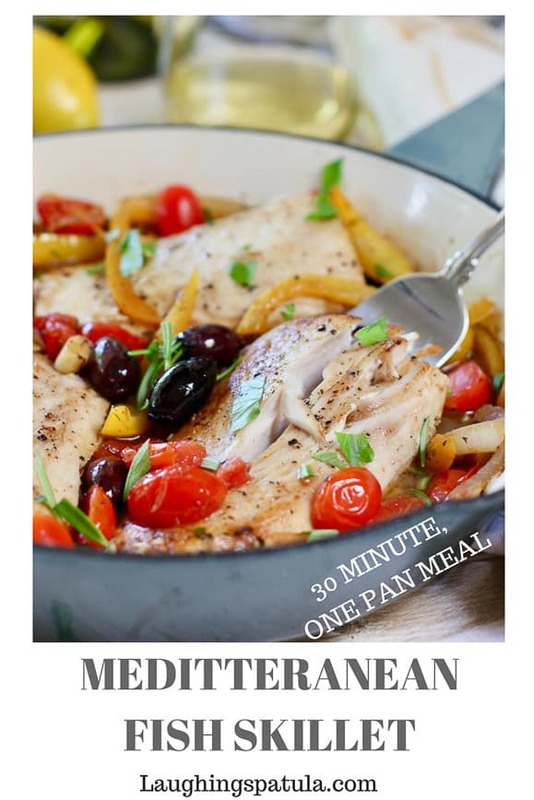 This Easy Mediterranean Fish Skillet comes together in less than 30 minutes and is made in one pan. Packed with healthy veggies and a ton of flavor! You will make this over and over again! We have all heard about how good a Mediterranean diet is for us. But it is not always easy to capture all the healthy benefits in one dish. Let alone in less than 30 minutes with easy ingredients. Got ya covered here! Use a firm white fish such as cod, halibut or mahi. We used mahi for this dish because the texture allows it to easily be seared. (it’s also what I had on hand), but you can use your favorite. Use a cast iron, enamel or non stick pan. We love this blue enamel cast iron skillet! We kept this recipe simple. Some additional add-ins would be: artichoke hearts, zucchini and asparagus pieces just to name a few. Substitute the white wine for chicken stock if you are Whole30 or Paleo. 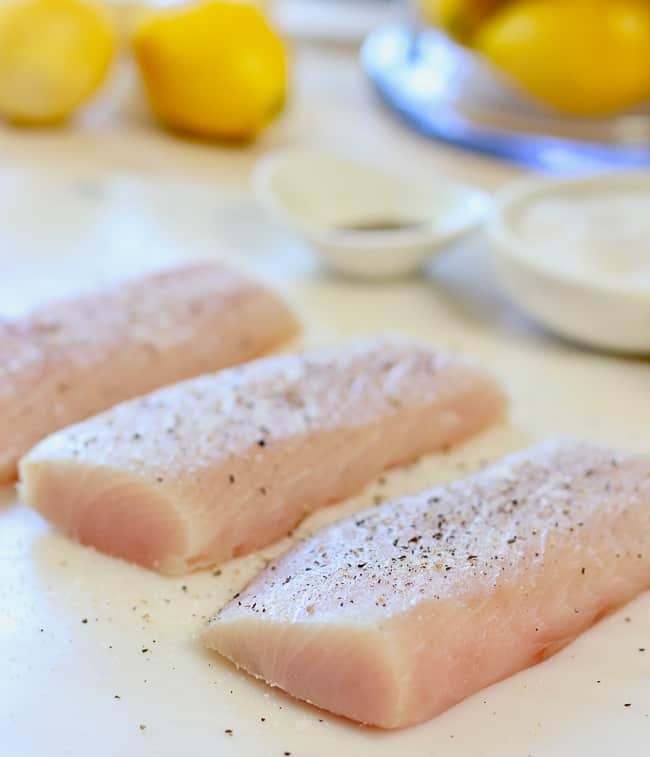 Pat dry your fish fillets with a paper towel and sprinkle liberally with salt and pepper. Chop your veggies and set aside. This is gonna go quick! Next, heat your pan to medium high. Add about 2 tablespoons of good olive oil and let it heat up until shimmery but not smoking. Put the fish in the hot pan and don’t touch it! Let it sear for 3-4 minutes. Test to see if it will release from the pan easily, if it’s sticking give it another minute. This technique works for all forms of protein. Chicken, fish and pork. Remove the fish and add your veggies to then skillet. Nestle the fish back on top of the slightly cooked veggies along with the wine and chicken stock. Continue to cook until your fish is done and the tomatoes burst! Sprinkle with a bit of feta cheese, fresh basil or parsley. At around 250 calories a serving this dish will become one of your favorite go to healthy meals. A super easy way to get more fish in your diet! 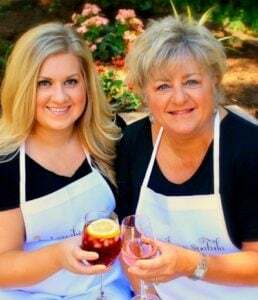 We love healthy meals and have over 100 recipes! You can see them all HERE. 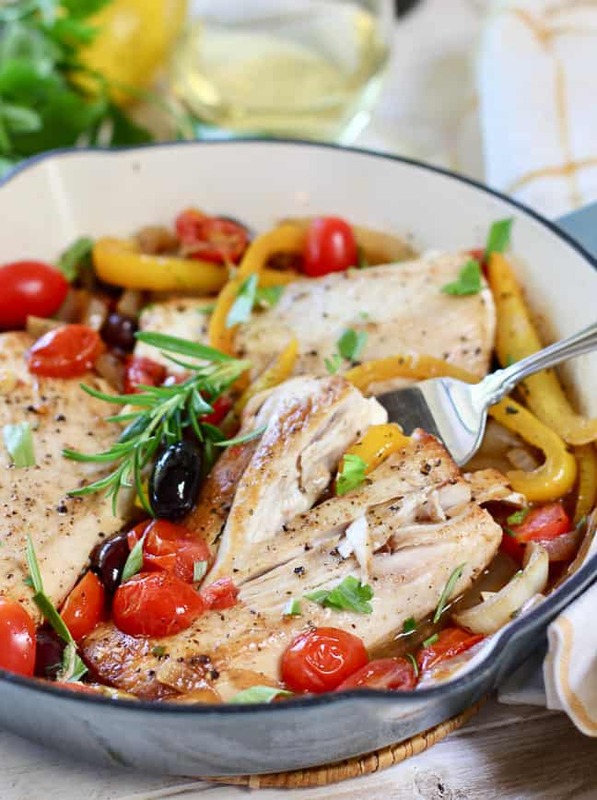 Two of our favorites are Zucchini Noodles and Shrimp and this Greek Chicken Sheet Pan Dinner. Both of them come together in less than 30 minutes! 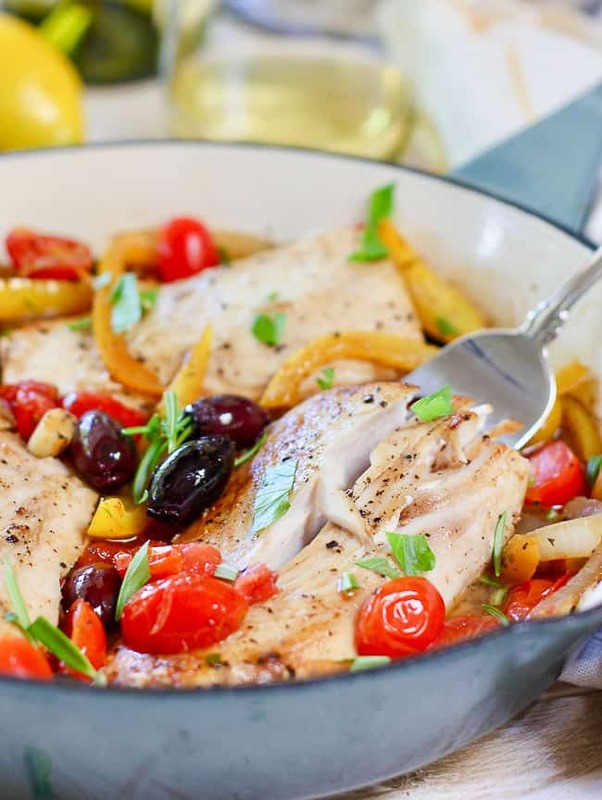 A 30 minute healthy fish skillet dinner that is made in one pan. Packed with healthy veggies and fish with tons of flavor! Pat fish dry with paper towel. Sprinkle liberally with salt and pepper. Slice vegetables and set aside. Heat large cast iron or non stick skillet to medium high heat. Add olive oil and heat for about 30 seconds or until shimmery but not smoking. Add fish to hot skillet. DO NOT TOUCH. Sear for 3-4 minutes on each side. When the fish releases from the pan easily it is ready to flip. 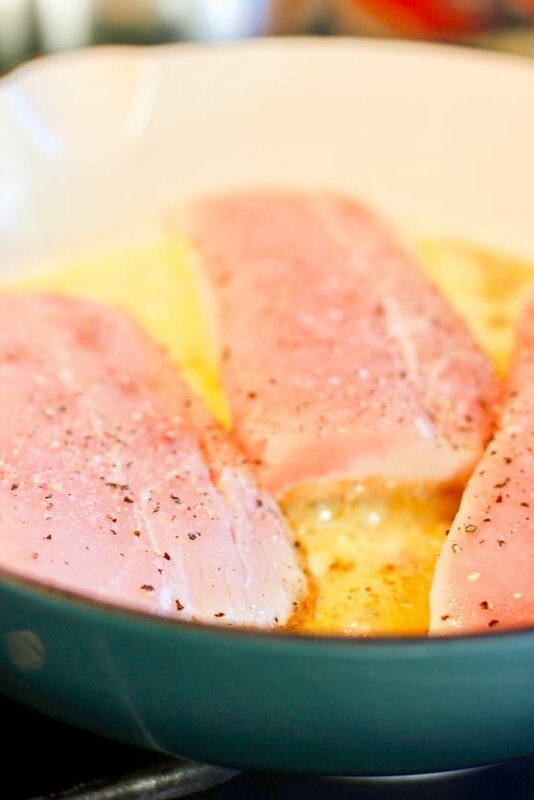 Remove fish from skillet and set aside. Add peppers and onion to skillet. Cook 2-3 minutes until slightly soft. Add garlic and tomatoes. Season with salt and pepper. Add basil, white wine and chicken stock to vegetables in pan, scraping up all the little bits from the bottom. Add fish back to skillet and continue to cook until cooked through and fish flakes easily. Another 3-4 minutes. Toss kalamata's into the pan until slightly heated. Serve with a sprinkle of feta, fresh basil or fresh parsley and lemon wedges if desired. 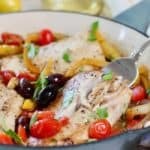 2 Weight Watcher Freestyle points per serving (1 point if you sub chicken stock for wine). Yum! All my favourite flavours! I have some halibut just waiting for a dish like this. Beautiful, delicious and healthy, too!